FORT WORTH, Texas (Sept. 26, 2018) – Junior Blake LaRussa, who guided Old Dominion to a stunning 49-35 upset win over No. 13 Virginia Tech, is the Davey O’Brien National Quarterback of the Week for week four, the Davey O’Brien Foundation has announced. On Saturday, LaRussa came off the bench in the team’s second offensive series to lead the Monarchs to their first win of the year. 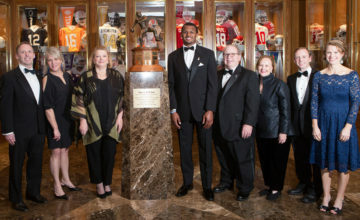 LaRussa, who also was named the Walter Camp National Offensive Player of the Week, threw for 495 yards and four touchdowns. He completed 30 of 49 pass attempts (61.2 percent) and also added a rushing score. His 495 passing yards were the most by an FBS player in week four, and are the fourth-highest total in 2018. In addition, LaRussa’s 501 yards of total offense rank as the fifth most in a game this season. 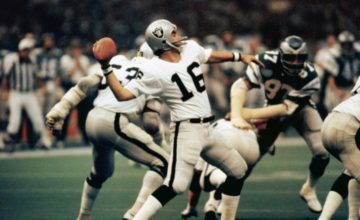 He notched career bests in completions, attempts, passing yards, total offense and touchdowns. 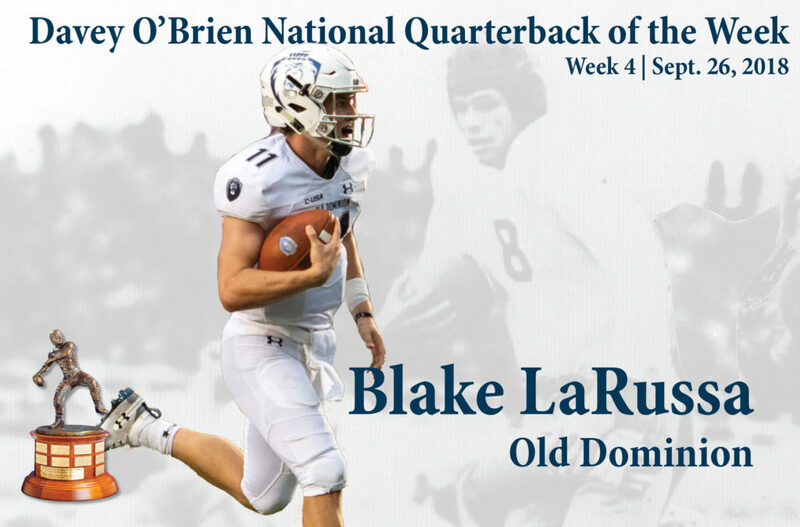 LaRussa is the first Old Dominion player to earn Davey O’Brien National Quarterback of the Week honors. The Punt & Pass Podcast will discuss his performance on Thursday. The other Great 8 quarterbacks in the season’s fourth week were: Purdue’s David Blough, Ian Book of Notre Dame, Texas Tech’s Alan Bowman, K.J. 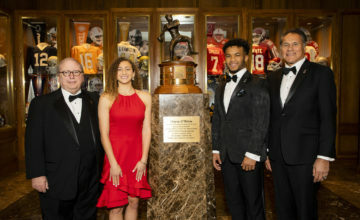 Costello of Stanford, Texas’ Sam Ehlinger, Mitchell Guadagni of Toledo and Alabama’s Tua Tagovailoa.